During March 2008, a salvage excavation was conducted at the village of Jatt (Permit No. A-5388; map ref. 204467–88/700325–41), prior for construction. The excavation, on behalf of the Israel Antiquities Authority, was directed by A. Masarwa (pottery reading), with the assistance of R. Mishayev and T. Meltsen (surveying and drafting), T. Sagiv (field photography), M. Shuiskaya (pottery drawing) and M. Peilstöcker (scientific guidance). The excavation was located at the top of a chalk hill (125 m above sea level; hereafter, asl), c. 1 km east of the ancient tell. 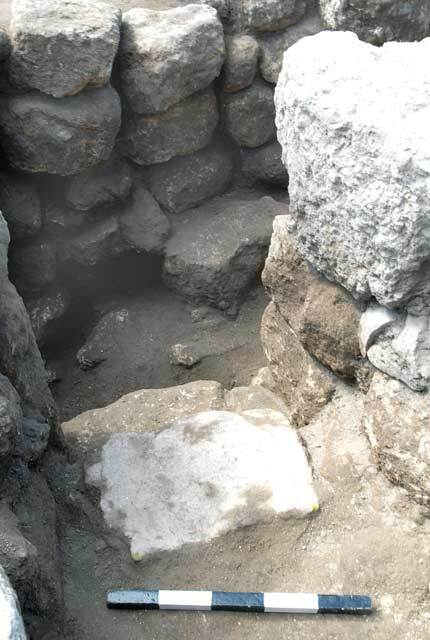 Several archaeological excavations, which exposed settlement remains, ranging from the Early Bronze Age to the Middle Ages, fortifications remains and burial caves, had been conducted in the past next to the current excavation area (‘Atiqot 37:1–78 [Hebrew]; HA-ESI 116). Two and one half squares (A2, B2, B3; Fig. 1) were opened and remains of a floor from the Byzantine period and two construction phases of a building from the Mamluk period were excavated. Remains of a floor (L41; 92.84 m asl) that consisted of tamped gray plaster were exposed in Square B3. As no remains of walls abutting the floor were found, it is impossible to know what its use was. 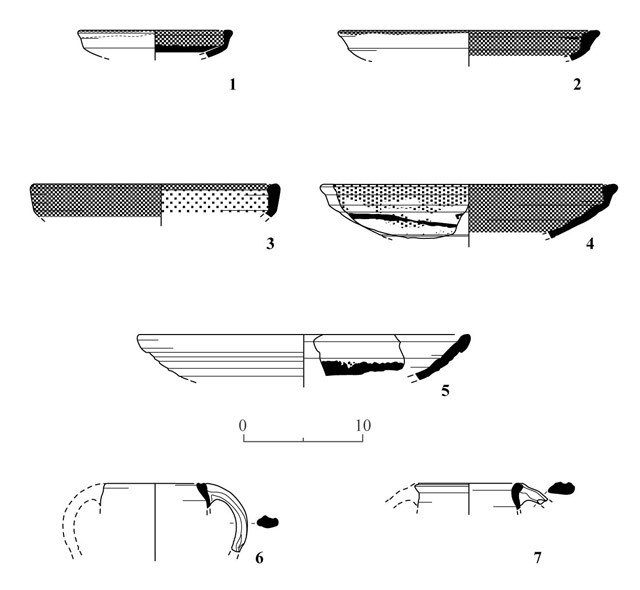 Pottery fragments were found on top of Floor 41 (L252) and in a probe cut in its southern side (L253), including bowls (Fig. 2:1–3) and store jars (Fig. 2:4) from the Byzantine period. Two construction phases of a building were discerned. A built water reservoir (2×4 m) was ascribed to the first phase. The entrance to the reservoir was from the north, via a corridor delimited by walls on either side (east – W10, west – W12), at whose end was a staircase (width 0.6 m; Fig. 3), flanked by two pillars (east – W11, west –W14). The reservoir itself was enclosed by the entrance pillars in the north and by a wall (W17) in the east. The southern border of the water reservoir was not discovered and only scant remains of its western wall survived. The walls, pillars and stairs were dry built of dressed limestone. The floor (L44) of the water reservoir abutted all the walls and its ceiling was not preserved, yet it was probably vaulted based on the curvature of the walls (diam. 2 m; Fig. 1: Section 2-2). The floor, walls and ceiling were coated with pink hydraulic plaster that was well preserved. Traces of fire were discerned on the walls, pillars and staircase. The ceramic finds from this phase dated to the Mamluk period and included bowls (Fig. 4:1–5) and jugs (Fig. 4:6, 7). A wall (W13; Fig. 5) built inside the reservoir of roughly hewn stones without mortar and oriented east–west was ascribed to the second phase. The wall divided the reservoir into two and unlike the sides of the reservoir, had no signs of fire. 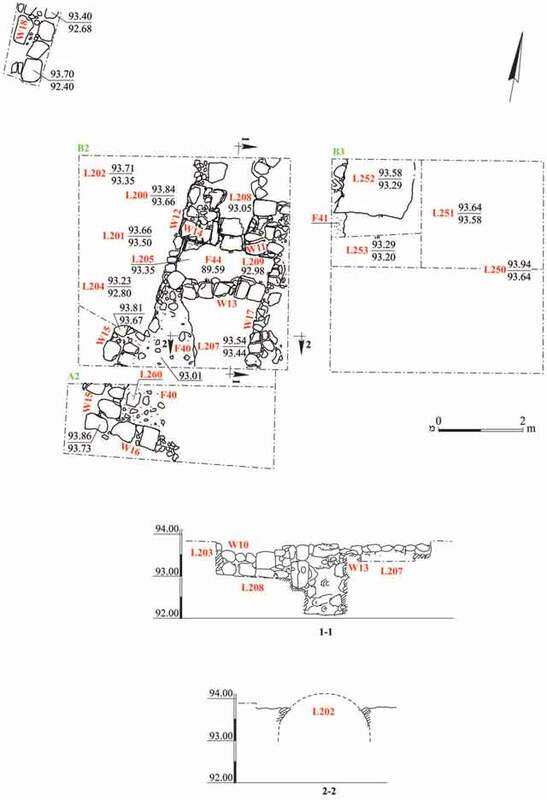 Two other walls (W15, W16) and a floor (L40) that abutted them, which were built in the second phase, were exposed in Square A2. The walls and floor were probably the remains of a room that belonged to a Mamluk building. A north–south aligned wall (W18) of unknown date protruded above surface, c. 10 m north of Square B2. 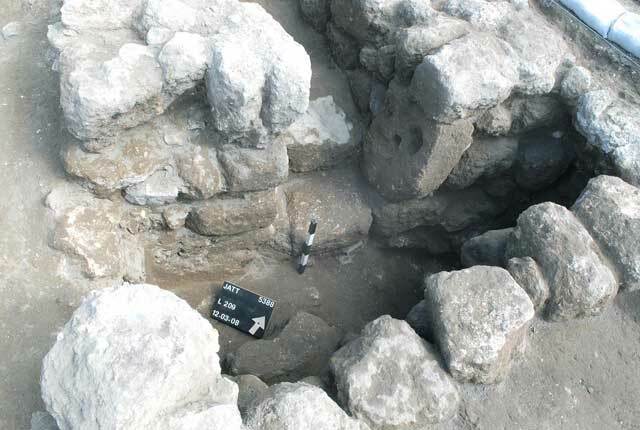 The finds indicate that the chalk hill was inhabited in the Byzantine and Mamluk periods. The remains from the Byzantine period were meager and insufficient to establish what activity had transpired at that time. The remains from the Mamluk period were part of a large structure, probably a public building, which had two construction phases. The water reservoir ceased to be used toward the end of the first phase of the Mamluk building; a fire that occurred in it was probably the reason behind the abandonment of the building in the first phase. A wall was built inside the water reservoir in the second phase, although the use of this part of the building is unclear. However, it was certainly not used for storing water since no hydraulic plaster was applied to the wall added in this phase. Remains postdating the Mamluk period were not discovered in our excavation, yet it is known that the site continued to be occupied in the following periods (‘Atiqot 62:47–51). 2. Pottery from the Byzantine period. 3. The opening to the water reservoir, the steps and pillars, looking northeast. 4. Pottery from the Mamluk period. 5. The water reservoir opening and W13 of the second phase opposite it, looking south.